Anyone who owns an electronic device knows that lithium ion batteries could work better and last longer. Now, scientists examining battery materials on the nano-scale reveal how nickel forms a physical barrier that impedes the shuttling of lithium ions in the electrode, reducing how fast the materials charge and discharge. Published last week in Nano Letters, the research also suggests a way to improve the materials. The researchers, led by the Department of Energy's Pacific Northwest National Laboratory's Chongmin Wang, created high-resolution 3D images of electrode materials made from lithium-nickel-manganese oxide layered nanoparticles, mapping the individual elements. These maps showed that nickel formed clumps at certain spots in the nanoparticles. A higher magnification view showed the nickel blocking the channels through which lithium ions normally travel when batteries are charged and discharged. "We were surprised to see the nickel selectively segregate like it did. 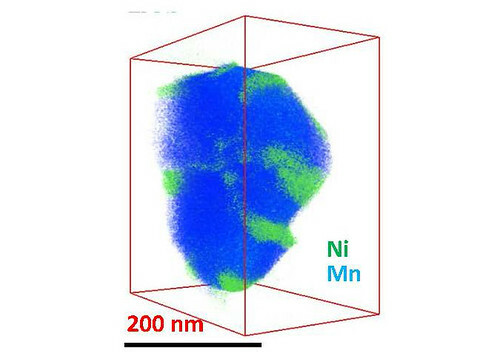 When the moving lithium ions hit the segregated nickel-rich layer, they essentially encounter a barrier that appears to slow them down," said Wang, a materials scientist based at EMSL, the Environmental Molecular Sciences Laboratory, a DOE user facility on PNNL's campus. "The block forms in the manufacturing process, and we'd like to find a way to prevent it." Lithium ions are positively charged atoms that move between negative and positive electrodes when a battery is being charged or is in use. They essentially catch or release the negatively charged electrons, whose movement through a device such as a laptop forms the electric current. In lithium-manganese oxide electrodes, the manganese and oxygen atoms form rows like a field of cornstalks. In the channels between the stalks, lithium ions zip towards the electrodes on either end, the direction depending on whether the battery is being used or being charged. Researchers have known for a long time that adding nickel improves how much energy the electrode can hold, battery qualities known as capacity and voltage. But scientists haven't understood why the capacity falls after repeated usage — a situation consumers experience when a dying battery holds its charge for less and less time. To find out, Wang, materials scientist Meng Gu and their collaborators used electron microscopy at EMSL and the National Center for Electron Microscopy at Lawrence Berkeley National Laboratory to view how the different atoms are arranged in the electrode materials produced by Argonne National Laboratory researchers. The electrodes were based on nanoparticles made with lithium, nickel, and manganese oxides. First, the team took high-resolution images that clearly showed rows of atoms separated by channels filled with lithium ions. On the surface, they saw the accumulation of nickel at the ends of the rows, essentially blocking lithium from moving in and out. To find out how the surface layer is distributed on and within the whole nanoparticle, the team used a technique called three-dimensional composition mapping. Using a nanoparticle about 200 nanometers in size, they took 50 images of the individual elements as they tilted the nanoparticle at various angles. The team reconstructed a three-dimensional map from the individual elemental maps, revealing spots of nickel on a background of lithium-manganese oxide. The three-dimensional distribution of manganese, oxygen and lithium atoms along the surface and within the particle was relatively even. The nickel, however, parked itself in small areas on the surface. Internally, the nickel clumped on the edges of smaller regions called grains. To explore why nickel aggregates on certain surfaces, the team calculated how easily nickel and lithium traveled through the channels. Nickel moved more easily up and down the channels than lithium. While nickel normally resides within the manganese oxide cornrows, sometimes it slips out into the channels. And when it does, this analysis showed that it flows much easier through the channels to the end of the field, where it accumulates and forms a block. The researchers used a variety of methods to make the nanoparticles. Wang said that the longer the nanoparticles stayed at high temperature during fabrication, the more nickel segregated and the poorer the particles performed in charging and discharging tests. They plan on doing more closely controlled experiments to determine if a particular manufacturing method produces a better electrode.